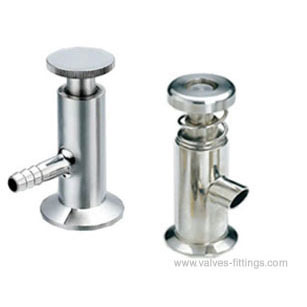 AV-7S Sampling valves are used in piping systems or on tanks for sampling. It can also be assembled at the bottom of the tank or pipeline for residue drain. Sampling port size available: 1/4", 3/8", 1/2",3/4"
The AV-7S-1 type is used for low viscosity materials, such as water, beer, wine, fluid milk and so on. When rotating the handle wheel clockwise, the valve will be open for sampling. When rotate the handle wheel anti-clockwise, the valve will be closed. The AV-7S-2 type is used to treat high viscosity materials, such as yogurt, syrup, ice cream, etc. The valve is normally closed design, it will open when pushing the handle and will return to nominal close position automatically by spring.